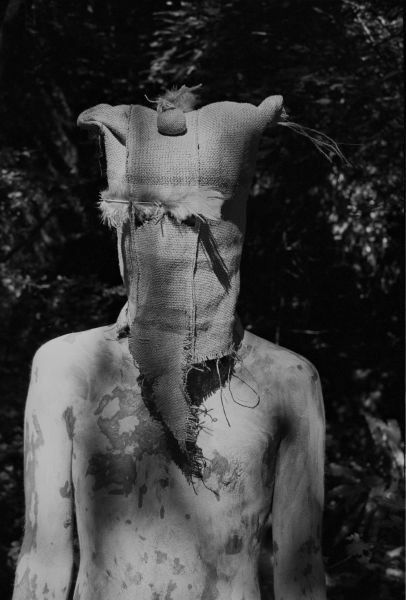 In his first institutional solo exhibition in Germany at the Kunstverein in Hamburg, Ben Rivers focuses on secluded parts of the world and its population groups which he examines in regard to their isolated and utopian socialization. Rivers’ films combine landscape and portrait shots with ethnological methods and elements of travel documentations, without strictly adhering to the respective genre rules. His filmic essays focus on people and life plans in marginal regions of our civilization and beyond our societal conventions. In analogy to regarding the cinema as a self-contained experiential space to which social norms and notions only conditionally apply, Rivers grasps his filmic works as meditative portrayals of secluded places and hermetic worlds. For his recordings, he uses 16mm cameras, often developing the film by hand. This closeness to the material and its almost tangible physical presence are reflected in his works that integrate their manual production process in the narration. Moreover, Rivers subtly intervenes in the postproduction phase and sets the film to poetic audio tracks that disrupt the visual contemplation. In this manner, Rivers repeatedly distances his films from their utopian fiction and grounds them in a reality, whose effects do not even leave the most remote islands and their inhabitants untouched. Environmental phenomena such as El Nino, polluted oceans, and also the impact of the global trade routes have long left their mark on the environment of the supposed paradises. The exhibition Islands consists of three large-format video installations that convey the narrative dramaturgy of the works into the gallery space and offer the audience a haven separated from their daily lives, so to speak. All three works employ the view to a spatial and temporal distance in order to reflect upon our own here and now. There Is A Happy Land Further Awaay (2015) combines landscape shots from the South Pacific island state of Vanuatu with Henri Michaux’ melancholic poem I Am Writing To You From A Far Off Country. Rivers’ recordings were made shortly before Vanuatu was devastated by the tropical storm Pam in March 2015. The film underlines the ongoing changes to our environments and their global consequences. The Creation As We Saw It (2012) also originated on Vanuatu and illustrates three legends of the inhabitants handed down by oral tradition; idiosyncratic creation stories about the origin of humankind, the path of fire, and the reason why pigs walk on four legs. Slow Action (2010) links semi-documentary film material from Polynesia, Japan and Rivers’ birthplace Somerset with a dryly recited story of a mysterious future civilization. The text written by the American science-fiction author Mark von Schlegell gives rise to an ambivalent atmosphere between surreal witticism and profound vexation in combination with Rivers’ picture language. The exhibition is a cooperation project with the Triennale di Milano and the Camden Arts Centre. A publication by Mousse Publishing will appear in conjunction with the show. With the kind support of the Culture Department of the Free and Hanseatic City of Hamburg and the British Council.